Our Lemongrass wash for Acne Prone skin, helps to support the completion naturally with a mixture of essential oils and herbs to combat the causes of acne and rosacea. Lavender which helps regulate the amount of sebum our skin produces. The base consists of a gentle blend of olive oil, coconut oil and castor oil. The companion Acne prone skin moisturizing oil contains the same essential oils as the face wash but also includes Chamomile and Calendula to calm the skin and reduce redness and swelling. The base is a mixture of Hemp Seed oil and Grapeseed oil which are very light and will not clog your pores. Our Rose Geranium Face wash and oil helps support aging skin with a blend of essential oils that give free radicals (elements in our environment that breakdown cells) a one-two punch. Rose-Geranium will tighten skin and reduce large pores. It also offers anti-oxidant protection, prevents degeneration of cells, promotes cell renewal and proper blood circulation. Carrot Seed oil nourishes, tightens, rejuvenates and can help soften wrinkles. All of these effects will help support aging/dry skin and give your skin a more youthful glow. 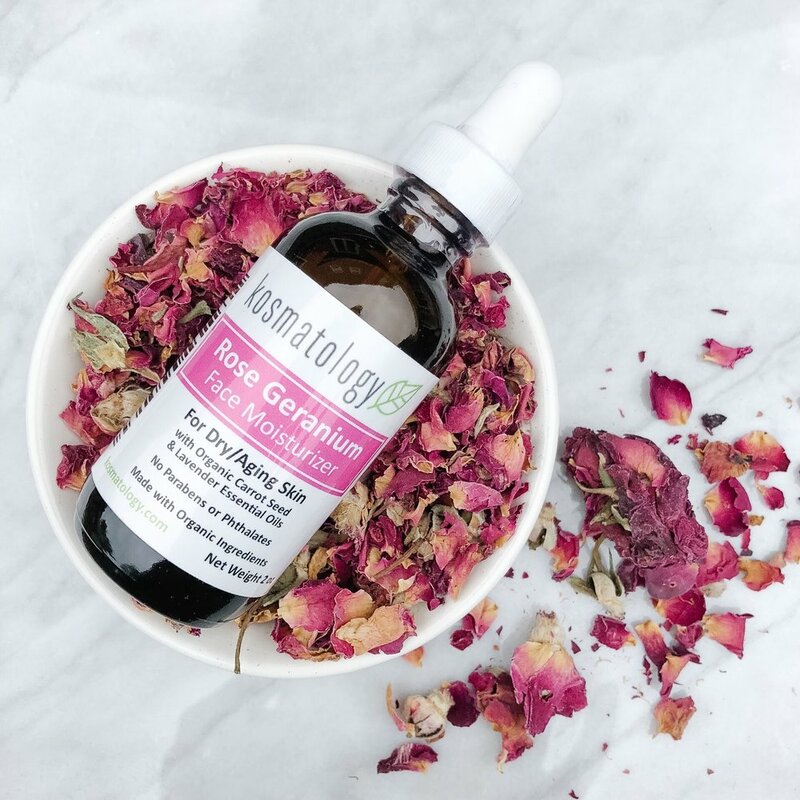 The matching Rose Geranium moisturizing oil contains the same skin supporting essential oils as well as Chamomile and Calendula to calm skin and reduce redness and swelling. The base is light but extremely moisturizing combination of hemp seed, grapeseed, jojoba and olive oil. Copyright © Kosmatology, LLC. All rights reserved.